Pabst Beer Eddie Cantor Ad 1947 This is a May 12, 1947 advertisement. 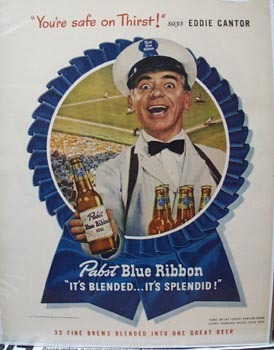 It is a nice color ad from Pabst Blue Ribbon Beer with a nice picture of Eddie Cantor. He is saying, You're safe on Thirst"". Looks like he is selling Pabst at a baseball game. In mint condition. This photo is taken through plastic and may show wrinkles or crookedness that is not in the ad. This magazine tear sheet measures 10 1/4"" wide by 13 3/4"" tall. Items Similar To "Pabst Beer Eddie Cantor Ad 1947"